Just as the name implies the “loop antenna ” is an antenna made in some configuration of a loop. That’s a rather simplistic description of an effective antenna. These configurations aren’t necessarily round in shape, many people use lengths of copper tubing/pipe combined with 45 degree elbows to create the loop. 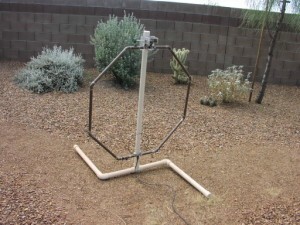 There are some loop antennas which are actually round but they were built by someone with access to a tubing bender capable of bending copper. Some of these links may be dead, please contact us if you find a dead link so we can remove it from the site.